Hal is another year older. How delightful! We just celebrated his birthday with friends. It’s always great to have the house full of voices and laughter. People went to the garden for mouthfuls of early blackberries, pulling onions and picking greens. There were waffles and omelets, games, and drinks. Why don’t we do these things more often? 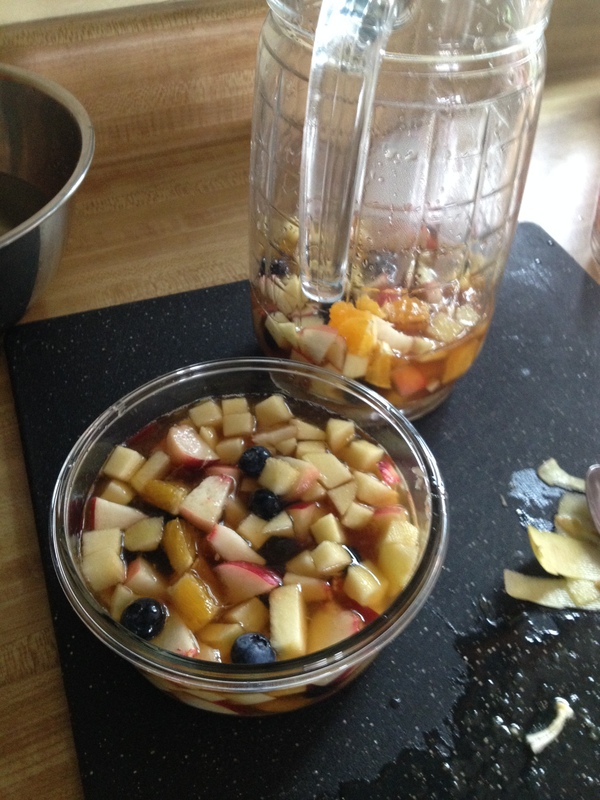 My experimental sangria seemed like a hit, so I’ve decided to share the recipe. Mix brandy, fruit and sugar together. Allow mixture to chill in the refrigerator. Add wine and lemonade half hour before guests arrive. Serve in a wine glass with a tablespoon of the fruit mixture. Brandy is optional; so is sugar, especially with sweeter lemonades. Without brandy you will get a lighter, watered down wine spritzer. You may substitute carbonated water for lemonade; this will be less sweet, so I recommend adding the sugar in this case.